The Senator representing Delta central Senatorial District, Obarisi Ovie Omo-Agege, yesterday, Sunday, December 16, 2018 gave out N5million as empowerment to 250 petty traders, at Christ Delight Assembly, Igbogidi, Udu LGA, Delta state and SS Peter and Paul Catholic Church, Ughelli, in continuation of his periodic market women empowerment programme which started more than a year ago. to each of the beneficiaries, totalling about 250 women, with 100 drawn from Christ Delight Assembly, Igbogidi, 100 from SS Peter and Paul Catholic Church, Ughelli and 50 from St. Theresa Catholic Church, Ekiugbo. Senator Omo-Agege said he considered it a moral imperative to give back to the society especially the women who supported and elected him into office in 2015. He expressed his profound gratitude to the women for being there for him during the 2015 elections and urged them to reaffirm their commitment to the betterment of Urhobo nation by re-electing him and President Buhari in 2019 and by also voting massively for Chief Great Ogboru as Governor. "I stand before you here, my mothers and sisters, to give a heartfelt appreciation for all your great support for me in 2015. Having supported me to become your Senator, I consider it a moral necessity to return to you with deep appreciation and to let you know that I have your interest at heart. As you all know, this empowerment started in 2017 and so far, thousands of our women and youths have been empowered. This empowerment became imperative at this time in order to help boost your businesses especially as the Christmas and New year celebrations are around the corner," he said. Responding to the kind gesture of the Senator, one the beneficiaries, who simply gave her name as Mrs. Margaret, commended Senator Ovie Omo-agege for empowering the Church women at this time, when Christmas and New year is around the corner. Responding on behalf of Christ Delight Assembly, Apostle Johnmark Ighosotu, General Overseer of the Church expressed heartfelt gratitude to Senator Ovie Omo-Agege for deeming it morally right to give back to the society. He noted that the Senator's action is unprecedented in the history of Delta Central, and a clear pointer to the fact that he feels the pains of the common people and he shares in them. Also, the Parish Priest of SS Peter and Paul Catholic Church, Ughelli, Rev. 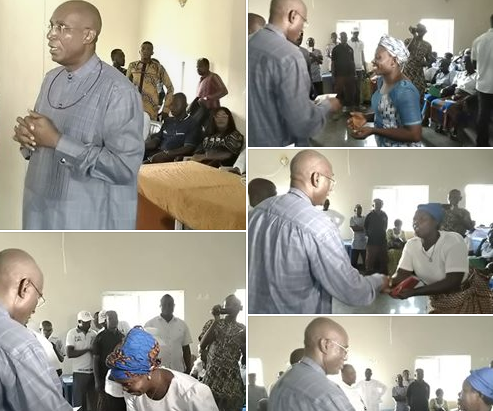 Father Godwin Orudje, thanked Senator Ovie Omo-Agege for the laudable initiative that has led to the empowerment of thousands of women in Delta Central Senatorial District.